Oriental Cuckoos are winter visitors to Australia and unlike all of our other cuckoos, do not breed here. Mainly seen in northern Australia, occasionally they are sighted as far south as Sydney.They are more widespread in the Top End and coastal Queensland with the odd vagrant records south to the Pilbara. 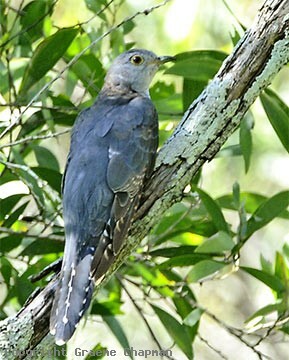 In many respects, Oriental Cuckoos resemble Pallid Cuckoos in their habits, but instead of inhabiting the drier and open country preferred by the Pallid Cuckoo, Oriental Cuckoos are found in more humid habitats such as monsoon forest, wet eucalypt forest, river margins and near mangroves. Oriental Cuckoos are usually quite shy and solitary, and if disturbed fly low and fast - in transit they even resemble a hobby in flight. They feed a lot in tree foliage infested with caterpillars and are known to return to the same spot year after year. One such area is at Anstead Bushland Reserve which is up along the Brisbane River near Moggill - several birds have been seen there year after year. 336202-D ... Oriental Cuckoo, adult at Anstead Bushland Reserve in Brisbane.